Wir möchten uns ganz herzlich beim "Yoga für Alle EV" für die Organisation der "Langen Nacht des Yoga" letzten Samstag bedanken. Die lange Nacht fand dieses Jahr das erste mal in Berlin statt, die Erlöse dienen einem gemeinnützigen Zweck und werden dazu genutzt Yoga für Geflüchtete, Yoga im Frauenhaus, Yoga bei Essstörungen, Yoga für Trauernde, Yoga und Träuma Fortbildung und psychosensibles Yoga zu unterrichten. Für eine Spende von 10 Euro hast du ein Bändchen erhalten, dass dir den Eintritt zu über 20 Yogaschulen in Berlin ermöglichte. Die Klassen wurden kurz gehalten. In jeweils 45 Minuten haben wir vier Einheiten unterrichtet. Hier der Abend in Bildern. Wir starteten den Abend mit einer knackigen FLOW Klasse (Vinyasa Flow). Ein Klasse für fortgeschrittenere Yogis, die alle ganz schön zum Schwitzen brachte. We would like to thank the "Yoga for All EV" for organizing the "Long Night of Yoga" last Saturday. The long night took place in Berlin for the first time, the proceeds serve a charitable purpose and are used to teach yoga for refugees, yoga in the women's house, yoga in eating disorders, yoga for mourners, yoga and dreary education and psychosensible yoga. For a donation of 10 euros you got a little ribbon that allowed you to enter more than 20 yoga schools in Berlin. The classes were kept short. We taught four 45 minute units. Here the evening in pictures. We started the evening with a quite demanding FLOW class (Vinyasa Flow). A class for more advanced yogis, all of which brought a sweat.. Die nächste Klasse war Yoga/Tanz nach der Martha Graham Methode. Martha Graham hat den modernen Tanz neu geformt. Die Graham Methode verschmilzt Yoga mit Tanz. Laura hat fünf Jahre lang in New York direkt an der Martha Graham School for Contemporary Dance studiert und getanzt! The next class was yoga/dance according to the Martha Graham method. Martha Graham has re-formed modern dance. The Graham method fuses yoga with dance. Laura studied and danced in New York for five years directly at the Martha Graham School for Contemporary Dance. Für die letzte Klasse des Tages "Ashtanga Yoga Kurzserie" kam die Sonne raus! Wir haben uns kurzerhand dazu entschlossen die Klasse draußen zu geben und wurden mit einen wunderschönen Sonnenuntergang beschenkt. For the last class of the day "Ashtanga Yoga short seeies" the sun came out! We quickly decided to give the class outside and were given a beautiful sunset. Nochmals vielen herzlichen Dank an die Organisatoren und alle die im Studio vorbeigeschaut haben für einen wunderschönen Abend! Es war schön euch kennenzulernen, kommt uns bald mal wieder besuchen. Wir freuen uns auf euch und bereits auf die Lange Nacht des Yoga 2018! Many thanks again to the organizers and all of you who have passed through the studio of a wonderful evening. It was great to meet you, come and visit us again soon. 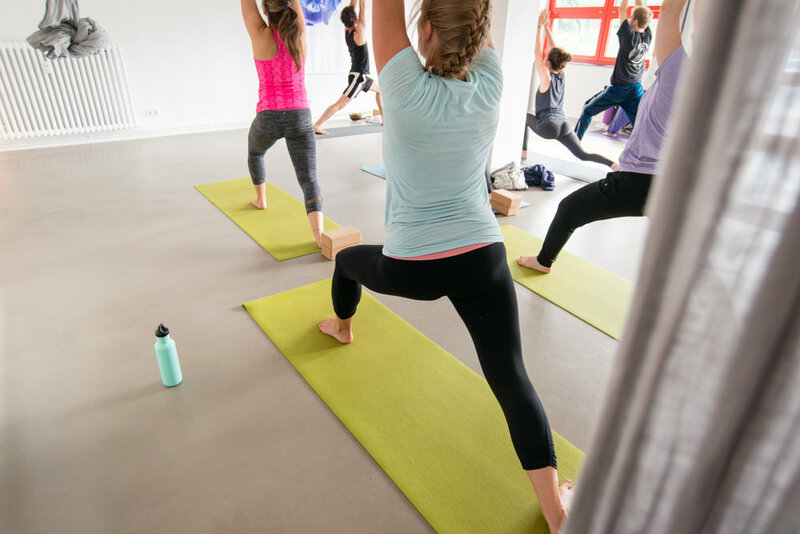 We look forward to seeing you again and already are looking forward to the Long Night of Yoga 2018! ....Es ist uns eine große Freude, euch mitzuteilen, dass Laruga Glaser unserer Einladung gefolgt ist und einen dreitägigen Workshop in der Yoga Rebellion Berlin geben wird. Sie ist eine der weltweit bekanntesten und sehr erfahrenen Vertreter des Ashtanga Yoga. Sie begann die Praxis dieser wunderschönen Stilrichtung des Yoga bereits im Jahre 1998 und studierte lange Zeit mit Sri K. Pattabhi Jois und dessen Enkel in Mysore / Indien, wo sie eine Autorisierung bekam, die Jahrhunderte alte Linie des Ashtanga an ihre Schüler weiterzugeben. Ihre Praxis ist geprägt von einer femininen Leichtigkeit, Friedlichkeit und einer außergewöhnlichen Kraft. Es wird sicher sehr bereichernd sein, von ihr zu lernen und so unsere individuelle Praxis zu vertiefen. Wir freuen uns sehr, euch in unserer schönen Schule Yoga Rebellion Berlin zwischen dem 10. und 12. März begrüßen zu können. Die Kosten des Workshops betragen insgesamt 300 Euro und umfasst mehr als 10 Stunden persönlichen Unterricht mit Laruga Glaser. Anmeldungen können nur durch Einzahlung bestätigt werden. Bei Stornierungen, maximal 3 Wochen im Voraus des Startdatums des Workshop, wird eine 20% Verwaltungsgebühr für Erstattungen entzogen. Es gibt keine Rückerstattungen für Stornierungen, die weniger als drei Wochen vor dem Startdatum des Workshops gemacht werden. We are very happy to be able to let you know that Laruga Glaser has followed our invitation and will give a three-day workshop at Yoga Rebellion Berlin. She is one of the world's well known and very experienced practitioner of Ashtanga Yoga. She began the practice of this beautiful style of yoga as early as 1998 and studied with Sri K. Pattabhi Jois and his grandchildren for a long time in Mysore, India, where she received an authorization to pass the centuries-old line of Ashtanga to her students. Her practice is characterized by a feminine lightness, peace and extraordinary strength. It will surely be very enriching to learn from her and thus deepen our individual practice. We are looking forward to welcoming you to our beautiful school Yoga Rebellion Berlin between the 10th and 12th of March. The cost of the workshop is 300 Euros and includes more than 10 hours of personal training with Laruga Glaser. body without strain. Discover balance, support and integrity in strength-based postures such as techniques for jumping back and jumping through as well as structural breakdown of challenging poses and transitions. Primary Series, otherwise known as, Yoga Chikitsa or yoga therapy, is the foundation all the sequences of the Ashtanga Yoga system are built upon and thus highly important. Not only is Primary Series the most important series but also preps the body/mind to open to greater states of awareness, concentration and stability. Learn to find steadiness and ease within each posture as we further investigate the intelligence behind the sequencing and the important application of dristhi, bandhas and breath. In addition, special attention will be focused on moving with conscious awareness, proceeding with conscious breath, otherwise known as vinyasa. Trouble shooting areas of instability that may be present, learn how to thoroughly build strength, with care and attention, building upon internal alignment. This workshop is appropriate for new and established practitioners and is broken up into two workshop sessions. Beginning with Dandasana and working up to Navasana. Picking up from Bhuja pidasana and finishing with Setu bandasana. The paradox of backbending is that we must be firm and soft at the same time, uniting the energy of strength and surrender. Learn the basic components of backbending with integrity to the natural flow of the body. In addition, learn to understand the concept of active release. When actively releasing, we experience the use of grounding mechanisms to establish the downward flow of energy while fully utilizing the breath to then be able to expand and deepen. In this workshop learn the foundational techniques that allow the body to find its depth and strength while at the same time letting go. For all levels. Intermediate Series, otherwise known as nadi shodana, meaning nervous system cleansing, builds upon the culmination of energy and purification within the practitioner built from the foundation of Primary Series. With deeper backbends and forward bends as well as arm balances, the Intermediate series integrates the use of opposing forces to garner greater unity and strength, both mental and physical, while opening the internal light of awareness within each individual. This workshop is designed to introduce students to the physical, energetic and mental faculties of Intermediate series, appropriate for those who have a solid understanding of Primary series. Payment and cancellation policy: Full payment is required to reserve your spot. There will be a 20% administration fee on refunds for cancellations made three week in advance. There are no refunds for cancellations made less than three weeks prior to the workshop start date. ....Wie beim Yoga geht es im Tanz darum loszulassen und sich dem Bewegungsfluss hinzugeben. „Free Play“ ist für uns das Ziel im Yoga, im Tanz, wie im täglichen Leben. Es geht um das Gefühl völlig im Hier und Jetzt zu sein. In der Bewegung haben wir nicht die Möglichkeit unsere Gedanken schweifen zu lassen, die uns entweder in die Vergangenheit oder in die Zukunft bringen. In diesem zweistündigen Workshop bringt Laura ihre Erfahrungen im Ashtanga/Vinyasa Yoga mit ihrer langjährigen Erfahrung als professionelle Tänzerin im Ballett und zeitgenössischem Tanz zusammen. Unter anderem arbeitete und studierte sie mit Rudra Bejart in Lausanne, Martha Graham School und Ensemble in New York, Les Grands Ballet Canadiens de Montreal. Sie hat Tanz in Ländern wie Schottland, England, Italien, der Schweiz und Deutschland an Hochschulen, öffentlichen wie Privatschulen unterrichtet. Dieser Workshop richtet sich gleichermaßen an Anfänger und Fortgeschrittene. Yoga as much as dance is about letting go and surrendering to the flow of movement. To us "Free Play" is the goal in yoga, in dance and in daily life. It's about being completely in the here and now. While moving, we do not have the possibility to let our thoughts roam and either bring us into the past or into the future. In this two-hour workshop Laura combines her experience in Ashtanga/Vinyasa Yoga with her long experience as a professional dancer in ballet and contemporary dance. Among other places she worked and studied with Rudra Bejart in Lausanne, Martha Graham School and Ensemble in New York and Les Grands Ballet Canadiens de Montreal. She has taught dance in countries such as Scotland, England, Italy, Switzerland and Germany at universities as well as public and private schools. This workshop is aimed at both beginners and advanced students. The workshop takes place on 10/08/2016 at 2 PM. Price is 20 Euros. Klassenplan nochmal neu! / Class schedule new once again! ....Wir haben unseren Klassenplan noch einmal geändert. Jetzt habt ihr sogar die Möglichkeit die Klassen direkt online zu buchen und bald auch online zu bezahlen. Vielen Dank an das MindBody Team! Den neuen Klassenplan findet ihr hier. We changed our class schedule once again. Now you have the possibility to book classes online and soon you'll be able to pay online as well. Many thanks to the MindBody team! You find the new class schedule here. Mysore Classes and Workshop with Elise Greenspoon (KPJAYI authorized 2 level ashtanga instructor) at YOGA REBELLION, Tuesday 19th until Saturday the 23rd of July! ....Elise unterrichtet Mysore Klassen von Dienstag dem 19.7. bis Freitag 22.7. von 8:00 bis 10:00 Uhr. Eine Klasse kostet 15 Euro. 11:30-13:30 “yama and niyama” Wie versteht und integriert man diese Philosophien in unser modernes Leben. 14:00-16:00 “moving the prana” Erkundung der subtilen Anatomie des Körpers und wie die Yoga Praxis uns hilft Lebensenergie durch den Körper zu senden. Teilnahme nur mit Voranmeldung! Bitte kontaktiert uns unter info@yogarbellion.com um euch anzumelden. Elise Greenspoon ist eine KPJAYI autorisierte 2nd Level Ashtanga Lehrerin mit über 10 jähriger Erfahrung in der Yoga Praxis, Ayurveda und östliche Philosophie. Momentan lebt sie in Koh Phangan, Thailand. Elise glaubt, dass der Weg des Yoga alles Leiden heilen kann und uns ermöglicht unser volles menschliches Potential zu leben. Da für sie die Erde und die Weiterentwicklung des menschlichen Bewusstseins sehr wichtig sind, teilt sie ihr Wissen und ihre Erfahrungen begeistert mit Menschen in der ganzen Welt. Es ist das erste Mal, dass Elise in Berlin unterrichtet. Elise is teaching Mysore classes from Tuesday 19.7. to Friday 22.7. from 8 AM to 10 AM. It is 15 Euros per class. Elise Greenspoon is a KPJAYI authorized 2 level ashtanga instructor with over a decade of experience in practice, ayurveda and eastern philosophies. Currently based in Koh Phangan, Thailand, Elise believes that the path of yoga can help to heal all of our sufferings and allow us to live to the peak of our potential as human beings. Caring deeply about the planet and raising awareness, she is always enthusiastic to share her knowledge and experience with people from all over the world. This is Elise’s first time teaching in Berlin.